The period after Wrestlemania often brings an onslaught of "future endeavoring" and it appears that last year's Tough Enough winner Andy "Silent Rage" Leavine is the first casualty of the post Wrestlemania 28 era. (Several wrestling websites are reporting this) But let's be honest is this really a big surprise? Big Andy hadn't been seen on WWE television since winning the competition just over a year ago. On the night of his big win, he was slapped by Mr. McMahon and on the receiving end of a Stone Cold Stunner by Steve Austin. In my view, not exactly the way you want to introduce a new talent and "future superstar" to the world. He made one last appearance in June 2011 in a backstage promo with CM Punk and Stone Cold. 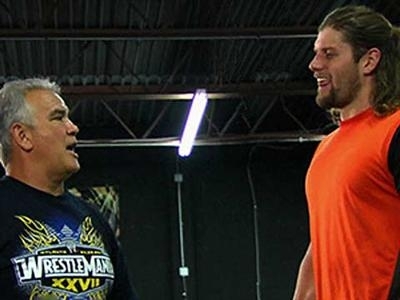 He had been sent down to train and refine his skills with FCW. They may have played a vignette on him down there at some point as well, but last summer he was suspended for a Wellness Policy violation. In my view, not a good thing for anyone, but especially someone who the company had seemed to expressed such an interest in by taking them to the top of the Tough Enough competition. In the final weeks of the competition, I was solely behind Jeremiah Riggs. But early in the show I was rooting for Matt Cross. I felt like he was eliminated WAY too soon. Now that I've met M-Dogg 20 (at AAPW Main Event), I really believe he has the tools to make it in the WWE. The guy seems like a class act to me, and although I'd hate the thought of him not being a part of future AAPW events, I would love to see him reach his dream and make it to the grandest stage of all in the WWE. But back to the point of this post, Leavine I believe is just the first in a series of releases coming our way in the next few weeks. What are you thoughts on "Silent Rage"? Did he ever get a fair shot? Post your thoughts here or on our Facebook wall. Whole thing was a complete farce.